Mountain Brook resident Palaniappan Sethu originally came to the U.S. from India to further his education. But Palaniappan, an associate professor of medicine and biomedical engineering at the University of Alabama at Birmingham, said he has found much more than that. More than a decade after coming to the U.S., Palaniappan said he has come to know the Over the Mountain community of Mountain Brook as a place where his family can grow and thrive. Photo Cutline - Solachi “Solai” Sethu Current occupation: Stay-at-home mom Education: Bachelor’s degree in commerce, Stella Maris College, Chennai, India; Master’s degree in business, Miami University, Ohio. Hometown: Chennai, India. Palaniappan Sethu Residence: Mountain Brook Occupation: Associate professor, UAB Medicine and Biomedical Engineering Education: Bachelor’s degree, mechanical engineering, PSG College of Technology, Coimbatore, India; master’s degree, industrial engineering, and master’s degree and doctorate, biomedical engineering, University of Michigan Hometown: Salem, India. His family includes his wife, Solachi, who goes by Solai, and their two sons, Karna, age 7, and Aarya, age 4. Karna is a first-grader at Cherokee Bend Elementary School, and Aarya is in preschool at Early Arts Center in Homewood. Mountain Brook and UAB are worlds apart from the Sethus’ original homes, they said. Both Palaniappan and Solai are from the south Indian state of Tamil Nadu. Palaniappan is from the city of Salem, and Solai is from Chennai, formerly known as Madras. Palaniappan grew up in India, where he completed his undergraduate education. He came to the U.S. in 1998 for graduate biomedical engineering studies at the University of Michigan, followed by postdoctoral training at Harvard University. Similarly, Solai was born in India and lived there while completing her undergraduate degree. Solai came to Miami University in Ohio to obtain a master’s degree in business administration. She returned to India for a short time after earning her master’s degree in business but came back to the U.S. after meeting and marrying Palaniappan. After the boys were born, Solai decided to be a stay-at-home mom until both boys are in school full time. Palaniappan was recruited to Birmingham from the University of Louisville, following the path of his Louisville colleague Sumanth Prabhu, who is now director of the Division of Cardiovascular Disease at UAB. Palaniappan’s research focuses on cardiovascular disease, especially systems that can mimic cardiac and vascular tissue to learn how disease occurs and how to regenerate injured tissue as well as aiding the search for new drugs to treat heart and blood vessel disease. As a family, Palaniappan and Solachi appreciated that metropolitan Birmingham is much like Louisville — a smaller city with short commute times and a great place to bring up young kids, with the chance for both parents to be a strong part of their children’s lives. The one drawback compared with Ann Arbor and Boston, and to a certain extent Louisville, is Birmingham’s more limited options for ethnic food, Palaniappan said. “So to satisfy our cravings, we often drive to Atlanta,” he said. After the Sethus homed in on Mountain Brook as the school district that best met their education goals for their children, the couple found a home in the Cherokee Bend neighborhood and put down roots. 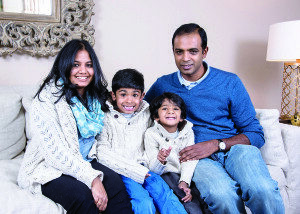 With a demanding career, Palaniappan said he values that his position allows him quality time to spend with each of his children, whether it’s coaching Karna’s first-grade basketball team, playing soccer with Aarya or just enjoying the outdoors as a family. With most of their family members back in India, they have many visitors during the year. Solai and the two boys travel to India for the summer break, with Palaniappan joining them for the end of their vacation. The couple said their travels to India during the summer give the children exposure to both cultures and ensure they are comfortable in both countries. The Sethus said they want to impart the rich tradition of India to help the family stay in touch with their Indian heritage. Palaniappan and Solai are fluent in English and in Tamil, their native language. Karna is now fluent in Tamil, and Aarya is working with his parents to become fluent as well. Being bilingual is essential, Palaniappan said, for the children to appreciate their Indian roots while living and receiving education in the U.S. While at home in the Over the Mountain area, the family said they emphasize maintaining a strong connection to India.